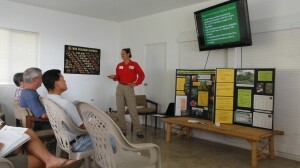 Tropical Edibles Nursery in Captain Cook, Hawaii, hosted Dr. Bogs to teach a weekend workshop on Soil: From the Ground Up. The event was sponsored by Hawaii Farm Bureau. The workshop covered the topic of soil nutrient deficiencies, the consequences of that, and how to correct the imbalances. Powerpoint presentations and hand-outs clarified the mysteries of soil analyses, while hands-on sections addressed plant tissue analysis and soil amending.